With home offices on two continents, a network of more than 400 distributor locations worldwide and 32 U.S. rental branches, Godwin -a Xylem brand- maintains a fleet of 6,000 portable pumps and 3,200 pieces of related equipment for use in construction dewatering, mining, drinking water supply and water/wastewater bypasses. The company manufacture, rent and sell a wide range of products, including the fully automatic self-priming Godwin Dri-Prime pump and accessories. Boasting more than 30 years as the industry leader in pump manufacturing, through its innovative approach to pump manufacturing, rental, sales, and service, Godwin is an immediately recognisable name in the international portable pump industry. Through Godwin’s policy of continuous investment and product innovation, the company’s original manufacturing plant in Quenington, Gloucestershire, can now truely be regarded as a world-class manufacturing facility. As the company’s products often perform critical pumping tasks in extremely harsh environments, the quality of the output of the Quenington factory is of paramount importance to the company. To help guarantee that Godwin retains its excellent reputation for the reliability and longevity of its products, regular investments are made in the best available inspection equipment. Typical of the company’s continuous pursuit of improvements in its component inspection routines is the recent purchase of a range of SmartPlugs from Bowers Metrology UK. Scott Hartshorn, Godwin’s Quality Inspector explained “In addition to undergoing meticulous final inspection routines in their fully assembled condition, each of our pumps’ component parts are inspected at all stages of the manufacturing process. In addition, the quality of all of our outsourced parts is verified at our goods inward department. Not only does this painstaking approach to our quality control function guarantee the delivery of first-class products, it also ensures that our scrap levels are maintained at an industry leading minimal level. “In addition to the continued adherence to Godwin’s quality ethos by our skilled workforce, the use of the latest digital gauges makes a significant contribution to our inspection activities. “Recently, mindful of the slight variations that we were finding in the bore measurements claimed by a subcontractor, and the gauge readings that we achieved, as part of our continuous improvement policy, we investigated the available gauges that would provide us with definitive results. “As we required micron levels of accuracy and repeatability and the ability to identify dimensional irregularities such as bell-mouthing, ovality and barrelling within critical bores, the choice of available gauges was limited. Having eliminated the alternatives, we purchased Bowers’ SmartPlugs and also convinced our subcontractor to adopt the same gauges. “In addition to several other applications, we now use SmartPlugs in our goods inward department to measure the bores on our subcontractor’s bearing brackets. As an incorrect bearing fit could have a negative effect on the quality of the pump, we are happy that we are now seeing these critical readings on, or much closer to nominal size. 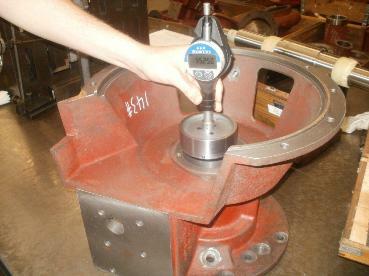 Available to measure diameters from 6mm –280mm; Bowers’ extremely robust and easy to use measuring plug gauges are designed to provide the operator with great speed of use, unmatched measuring accuracy and superb repeatability, even when used in harsh industrial environments, such as on or near machine tools. Advanced hand held ergonomics allied to an ingenious mechanical/electronic system render SmartPlugs the easiest to operate Bowers bore gauging system to date – by simply inserting the hard wearing plug into the bore to be measured, the required bore diameter is instantly displayed on the gauge’s built-in indicator. The flexible nature of Bowers’ SmartPlugs means that they can be supplied fitted with easy to read electronic indicators, ideal for automatic data collection, conventional analogue indicators, or transducer probes linked to remote digital readout units. For more information on Bowers' range of SmartPlugs, click here.